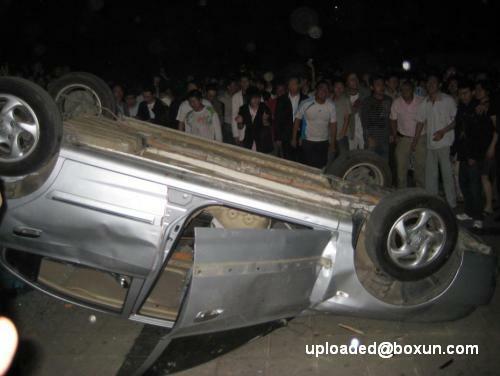 On May 20 at the May First Plaza in Mianyang city, Sichuan province, a shameful scene took place. A bunch of people driving a Hyundai car had the gall to set up a tent with the words "Reserved for disaster relief" on top. Everybody knows that these tents are supposed to be set up by the government, and this particular public plaza was not a temporary site for such tents. A 70-year-old woman got curious, and went up to ask questions. For her troubles, she was slapped by a tough-talking woman. When someone tried to help the old woman, he got assaulted by four of the men. So the masses got outraged and a mass incident occurred, during which the Hyundai was overturned. Address: Jiangyou city, Zhongba town, Huayuan Middle Road, Number 208, Unit 4, Numbers 5-8. 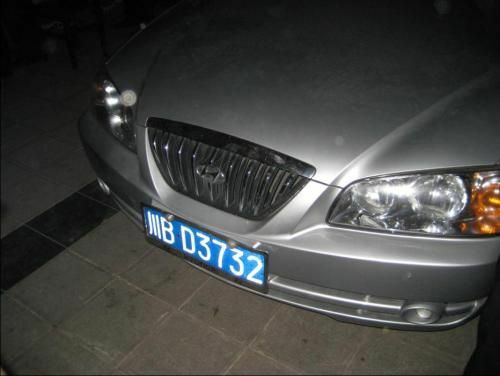 Vehicle description: Beijing Hyundai, Model BH7160A, engine serial number G4A5B459344. Mianzhu city Communist Youth League secretary Fan Xiaohua (范晓华) has been very depressed late. 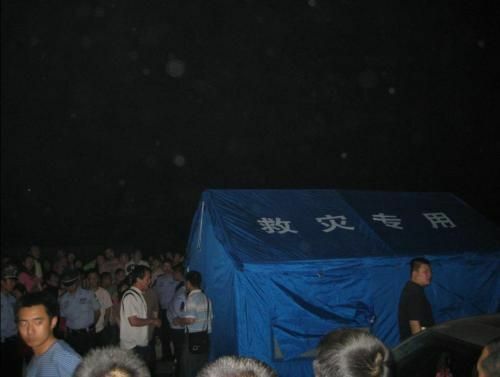 There had been an Internet rumor about someone setting up a disaster relief tent in the May 1st Plaza in Mianyang city on May 20 and also engaged in aggravated assault on other persons. The person was alleged to be one Fan Xiaohua (范小华), but the powerful human flesh search engines brought grief and pain to Communist Youth League secretary Fan Xiaohua (范晓华) instead. "Nowadays, I don't dare answer the mobile phone because it could be someone calling up to curse me out." On May 31, Fan Xiaohua (范晓华) was interviewed by Sichuan News Net. She said with a bitter smile: "I suppose that I am an Internet celebrity nowadays." "My name if Fan Xiaohua (范晓华), not Fan Xiaohua (范小华). Deyang and Mianyang are cities at the same level, and Mianzhu city is a county-level city under Deyang city. Mianyang and Miangzhu are not the same place. What was I doing in Mianyang at this critical moment of disaster relief here in Mianzhu city?" Fan Xiaohua (范晓华) produced the official statement form the Mianzhu Communist Party Committee: "Comrade Fan Xiaohua (范晓华) has not been to Mianyang since May 12. She has not been to the May 1st Plaza of Mianyang. Mianyang and Mianzhu are not the same place. Comrade Fan Xiaohua (范晓华) and her family did not have any tents after May 12, so they could not be staying in one. 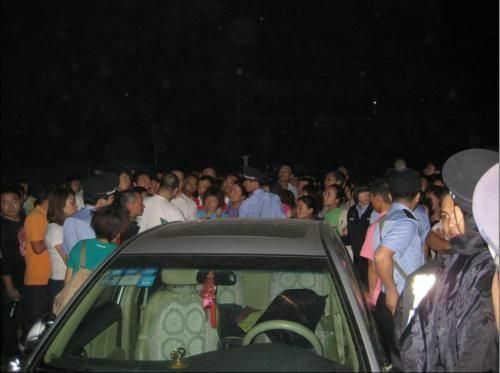 Each night, Fan Xiaohua (范晓华) and her colleagues slept inside cars. Comrade Fan Xiaohua (范晓华) and her family have never owned a car. The Mianzhu city Communist Youth League car has license number Sichuan F70034. The Sichuan BD3732 license plate has been found to belong to Fan Xiaohua (范小华) of Jiangyou city who is not Mianzhu Communist Youth League secretary Fan Xiaohua (范晓华)." "I have no idea who erected the disaster relief tent at the May 1st Plaza in Mianyang city, or assaulted people. I am certain that I did not do that!" (Southern Metropolis Daily) Value the freedom of speech, abhor Internet violence. June 6, 2008. Yesterday, the Mianzhu city Communist Youth League clarified that its secretary Fan Xiaohua (范晓华) was not the person who erected a disaster relief tent in the May 1st Plaza of Mianyang City and committed aggravated assault. 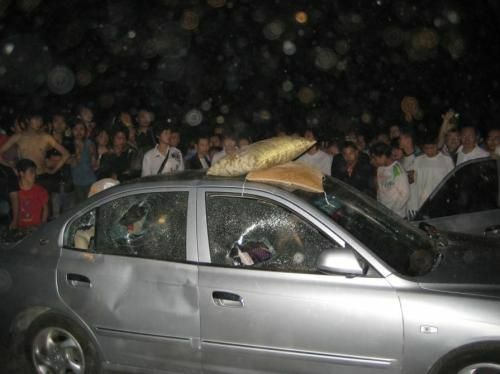 Actually, netizens had identified the perpetrator as Fan Xiaohua (范小华) as the owner of the car with license plate Sichuan BD 3732 and home address Jinagyou city, Zhongba town, Huayuan Middle Road, Number 208, Unit 4 and not the Mianzhu city Communist Youth League secretary Fan Xiaohua (范晓华). But this verification could not re-direct all of the anger and the criticisms and Fan Xiaohua (范晓华) remained the target for some. This official declaration reminded netizens that any more attacks against Fan Xiaohua (范晓华) and the Communist Youth League will be a clear case of rumormongering and libel. The victim Fan Xiaohua (范晓华) deserves our sympathy. The fact that she did not dare answer her mobile phone showed that the anger of some netizens was turning into attacks with a violent flavor. It is worthwhile to contemplate that if Fan Xiaohua (范晓华) were really Fan Xiaohua (范小华), then is it justifiable to apply Internet violence to her? And when Internet violence is sometimes good and sometimes bad, who is to judge? "The Bronze Moustache Gate," "Chen Jing saves her mother," "The Cat-Torturing Woman," and other incidents have shown that netizen violence cannot be ignored as a phenomenon. Internet violence usually begins as moral condemnation. So some netizens conferred the right to use violence upon themselves out of a sense of serving justice. They use verbal or even physical violence against the targets of their criticisms. In principle, this type of violence is illegal; in practice, it is hard to restrict Internet violence. On one hand, the distinction between Internet violence and other kinds of Internet public opinion pressure is blurry and difficult to judge. On the other hand, before the passions explode into rage, it is hard to predict which speeches will lead to violence. When the netizens get together to use violence, they also go in under the twin covers of group anonymity and personal anonymity.